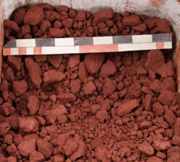 Test the "DARC Dirt 1" ore analog with a larger particle size. Increase the ore/charcoal ratio (more ore faster). Diameter: 20 cm Stack above Tuyure: 40 cm Tuyure Diameter: 1" (2.6 cm) I.D. The intent of this smelt was a full scale test of Gus Gissing's DARC Dirt One - primary bog ore analog. A new standard 'Norse Short Shaft' furnace was constructed. It was decided to make two alterations from the earlier tests: The analog had shown a tendancy to produce a crumbly high carbon bloom, a type which often proves difficult to forge down to a working bar. For that reason is was decided to increase the average particle size. The dried plates were lightly hammered through a 1 inch wire grid, then screened through a 3/16 inch mesh to remove the fines. This resulted in a slightly larger size than the last two tests. Second, it was decided to charge very heavily right from the start. Ore was added at one to one against charcoal (2 kg ore with 2 kg charcoal). We used 20 kg of the bog analog and got a very nice small bloom at 1.8 kg. The ore number is actually higher than reality. Thats because the analog is mixed with water, and the paste was air dried. There will be some content of water still remaining. I have to take a measured sample and put it into the gas forge on a pan to get a 'dry weight' that would relate it back to the roasted rock ores we have been using. On the last test, the analog was also air dried, and after baking the water content removed was about 12%. The bloom weight was taken at a different stage in the process than what we normally use to take that measurement. Normally we pull the bloom and work over the surface for one heat to knock off the real 'frobby' bits. This is when the production weight is recorded. For this bloom, which was pretty 'juicy' we had put it back into the smelter with more charcoal (using the smelter like a big forge). We ran through two more hammer cycles, compacting it down to a very rough brick, then one more to slice it in half. So there would have been a bit lower comparative weight to others. Taken together, this does put our yield down into the 10 - 15 % range - not into the 25 - 35 % range we have come to expect. We were running this smelt with a bit less air than normal. By the anemometer, we started in the range of 450 litres per minute, eventually working up to closer to 750 LpM. Our consumption of charcoal was averaging about 10 minutes for a standard 2 kg bucket. We generated very good slag volume numbers on this one (here). First the smelter itself came through the smelt with almost no internal damage at all. There was some erosion just BELOW (an odd location) the tuyere. The slag bath started out sitting a bit higher than normal. We had to poke through the bottom of the bowl as it first formed to drain it a bit lower to keep the tuyere clear. I think that might be the reason. There was no noticeable effect to the smelter wall above the tuyere at the usual hot zone. The inserted ceramic tuyere was hardly affected at all. We were just getting everything ready into the very end of the burn down phase when the furnace decided to self tap. It was like the waters breaking in a pregnancy. Pretty much all the liquid slag ran out all at once. This was the dark olive green / black real runny stuff. I got concerned that this would expose the top of the bloom to the air blast, so we quickly decided on a bottom extraction and reduced the air and got working to yank it all out. There was a very clear volume of slag that formed the bowl itself that was pulled clear. When we grabbed the bloom, there was a third type of slag adhered to the outside of it as well. The analogy of the chocolate covered cherry is perfect here. We were able to pretty much separate out the three types, and gather all of the slag for weighing. The bloom feels like nice iron . The spark testing suggests it has about the same carbon content as a mild steel. (At this point, some loss expected in the bloom to bar phase.) It is a bit on the crumbly side, more larger blobs hanging together than the nice dense rock blooms you always achieve. Better cohesion than the 'brown sugar' effect seen at the Smeltfest test of the ore analog. I know its going to be easy to forge this one to bar, the initial consolidation went very smooth, no slitting or fracturing at all. Overall a very good smelt!